Since decades BMW 1 Series M is regarded as the best performance model in its two door segment, but confined to a handful of models it earned its badges in the two door coupe segment only. Now stretching its wings it has come up with this all new BMW M235i Convertible 2015 with more of headspace. Though there are lot of similarities in M235i Convertible and the M235i Coupe but still anxious car lovers eyes are glaringly looking at this new model. Let us check its review. The interior of BMW M235i Convertible is very much familiar to its sibling, yet the convertible with great features tag remains in the lap with refined premium ambience. The interior is much more driver focused with sports bucket special seats, M version leather wrapped steering wheel with the fascinating metal trim and attractive Estoril Blue of gloss black accent stripes make the interior worth your penny. Talking about space door pockets get larger, with a larger Glove compartment. Center console comes with two cup holders and little storage space beneath the armrest. Also to add a little more to its styling looks the hand brake and shift boot are also blended with the leather work, combined together making the M235i convertible interior worth a look. 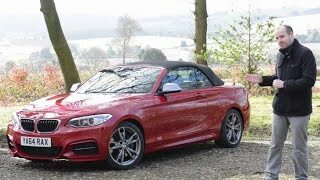 In the Exterior of BMW M235i Convertible some changes have been made in comparison to M235i Coupe. These changes include the little swoopy front end, stretched kidney grille with some sharper ends and larger cooling flanks. Headlights of M235i Convertible have also been extended a little portraying a unique design. Apart from these talking about the rear fascia and sides, all you gotta do is imagine the Coupe without its roof. The standard model comes with 17 inch alloy wheels, with an option to switch for 18 inch, while adding more the accessories range also includes 19 inch alloy wheels to its buyers, giving a performance oriented safe ride. 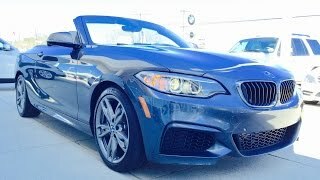 The BMW M235i Convertible comes with a 3.0 liter six cylinder engine producing power of 320 hp and 447 nm torque mated to six speed manual or eight speed Steptronic automatic with paddle shifters. The transmission option is solely in the lap of buyers, as to which one to chose. However we personally believe the manual mode is better option to go. 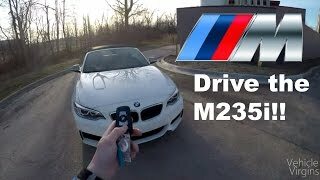 The power produced by engine takes the M235i convertible to a top speed of 155 mph. 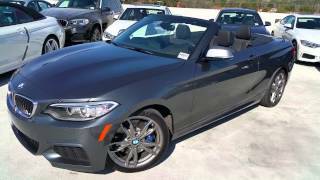 As far as price of BMW M235i Convertible 2015 is concerned the model’s price range begins with $48,650. The amount mentioned includes destination and handling charges worth $950.